Hi everyone, Kathleen here to share a mix media layout with you today a layout I created using the lovely Marion Smith's Junque Gypsy - Shangri La paper and Sans Souci papers featuring Helmar Zapdots. I began by using dry wall tape in a cross pattern. Then I came back and applied a diamond mask with modeling paste and spritzed some Lindy's Stamp Gang Tibetan Poppy Teal dabbed some Ponderosa Pine Olive and finally Hydrangea Blue for depth of pattern. Next I cut out the post cards from the Sans Souci paper and created my layers to frame the picture. Helmar has a wide variety of sizes, shapes and colors of zapdots, perfect for all of your layering needs. I used the Helmar clear 1/4 inch zapdot for the chandelier pull and for the bird cage. To give the picture plenty of lift I used the Helmar 1/2 inch round black zapdot. Now I have plenty of space to tuck my flowers, chippies and such around the picture. I hope what you have seen here today has inspired you to let your own creativity take flight. Greetings creative, crafty ones! Jenn here, with a practical and pretty addition to your home or a great gift for a travelling friend. I made a set of these map-covered tile coaster for my brother for Christmas and I liked them so much that I wanted a set for my house, too. While you can use any maps you want, what makes these really special is to focus on places you've traveled to or lived. And if you need printable maps, SitesAtlas.com is where I got most of the state maps I used and printed them to the size I needed. Brush a layer of Helmar Decoupage & Craft Paste onto the top of your tile with a foam brush. Place your map onto the tile and smooth it out with a brayer. A squeegee or even your hand will work for this, but I find that the brayer applies just the right amount of balanced pressure to roll out any air bubbles or wrinkles. Apply a coat of Helmar Decoupage & Craft Paste to the top of the map, working the map into any dips and crevasses in the tile's surface. (Fingers are your best tool here, go ahead and get a little messy.) While the paper is still damp with glue, tear the excess paper from the edges, smoothing the torn edges into place on the tile edges. Allow to dry completely. Sand the edges of the coasters to remove any excess paper and blend the map images into the tile edges. You can also distress the images themselves, like I did with the very prominent blue sections of the Florida tile, to give them a pre-weathered look. Wipe off any dust from sanding and give each coaster a couple coats of Helmar Crystal Kote Matte Spray. Finish them off by adding cork feet to protect your tables. You can find cut-to-size cork sheets that will fit your tiles perfectly or cut a larger sheet into 1" squares to apply to the corners, like I've done here. G'Day Vicki-Ann here and I am wishing you a Happy Australia Day. For Australia Day on the 26th of January, we all get together and most people have a BBQ. Well I know we are. Looking forward to my snag with bread and sauce, maybe a chop and a bit of coleslaw. So thought I would make a handy tray for all those things you have to carry outside to the BBQ. I got the tray from Kaisercraft and painted it with Gesso for the first layer. Then I painted the Australian flag on the bottom of the tray with DecoArt paints. Well my rendition of the Australian flag. I added some Rubons that had Aussie slang and phrases. I have had these Rubons for ages in my draw keeping them for just the right project. I then went over the whole bottom of the tray with Helmar Decoupage and Craft Paste and let it dry. This can look like oh no I have wrecked it, but take a breath it all dries clear. You can see were it is already drying in that bottom left corner. I wanted those Rubons to have a bit of protection, as this is going to get a bit of wear and tear. Using my Helmar Tacky Craft Glue I then attached the sides of the tray. I put a line right along the bottom edges and on the sides and held just till it gripped. Waited for it all to fully dry then sprayed 2 layers of Helmar Crystal Kote Matte Varnish over the tray to give it a fantastic seal. So wherever you are, hope you have a wonderful Australia Day. I bought some cute buttons from Button Galore that went with the fox / forrest theme I was looking for, got out my button clippers and voila. So easy after that. Be sure to back up your buttons and paper piecings with felt to not only to secure your paper clip to the button but also for a finished look, using of course Helmar 450 Quick Dry Adhesive to secure them. The Helmar 450 Quick Dry Adhesive is also great for gluing my paper on to my paper clips for my new Faux Midori cuteness. Isn't my Foxy Faux Standard Size Midori adorable! I love it, thank you for stopping by today. Hey folks, Tamiko here! I am a craft bargain shopaholic! That can be a good and a bad thing. It means I don't always spend a lot for my craft finds and sometimes I hoard the ones that I do! ::chuckles:: I was in the store some time ago and bought several of these little chipboard frames on sale, with intent to alter. I won't mention how long that intent lasted, because I am more then sure many of you can relate! Anyway, here is today's project! I began by taking my chipboard frame apart. I cut up a bunches of book paper text and used Helmar Decoupage and Craft Paste to collage them to the front. I allowed it to dry overnight, just because I could, ::smiles:: It wasn't neccesary, 30 minutes would have been fine. I then got a handful of mulberry paper flowers and leaves and began to place them on the outside of the frame along the boarder. I used the Premium Craft Glue by Helmar, because it not only dries clear, I think it's the best to use for this type of decoupaged surface. After the flowers were placed I grabbed some beads, metal charms and some blingy sparkle goodness to act as a fillers to various places within the flower and leafy placement. I used Helmar 450 Quick Dry Adhesive for those adornments, because it's a sturdier type of glue for those items and it tacks pretty fast! I had sooo much fun creating these frames.. I think I want to try a canvas next! The only thing I am more then sure about, is when I try it, I will have Helmar Adhesives by my side to make it happen!! Thanks for stopping by!!! Hi everyone, Steph Ackerman here today to share a fun Peek A Boo card. This card design allows you to see 2 different images and/or sentiments as you open and close the card. Starting with the 5 1/2" x 8 1/2" panel, create the interior panel by placing the long edge along the Scor Pal and scoring at 4 1/4". Adhere the 2 pieces of pattern paper to both sides of the score line using Helmar Quickfix Adhesive Runner. Using the 5 1/2" x 8 1/4" panel, create the front panel by placing the long edge along the Scor Pal and scoring at 2 3/4" to create the flap. Using Helmar Quickfix Adhesive Runner adhere the 5 3/8” x 5 3/8” pattern paper in place. Create an opening in the front panel using Spellbinders oval dies. Line up the interior panel and also die cut the openings. Align the interior panel with the front panel. Use Helmar Quickfix Adhesive Runner around the edges of the panel and around the oval opening and adhere to the front panel. Assemble the card back by scoring the remaining cardstock panel at 5 1/2". Adhere to the front panel using Helmar Quickfix Adhesive Runner. Stamp image on white cardstock and adhere to the back panel. Add some selective coloring. Adhere the smaller white panel to the front panel and stamp sentiment being sure that it shows through the opening. Using graduating sizes of Spellbinders dies, die cut scalloped oval frames to create a finished look around the ovals. Adhere the frames to the openings with Helmar 450 Quick Dry Adhesive. Then tear assorted papers to fit the left edge of the card front. To create additional dimension, use Helmar Zapdots to adhere the sentiment to the front of the card, slightly overlapping the opening. Hi, and welcome back to part II of an Owl and his treasure box. Last time we made the owl and attached him to a treasure chest, well....you need something to treasure in that chest, right? I made the tiniest little book using my Helmar Decoupage & Craft Paste and my Helmar Tacky craft Glue. and used the Helmar Decoupage & Craft Paste to glue some small bits and bobs that I cut out of a magazine. If you want to see all the pages in the booklet plus the process of making the owl and the chest you can visit my Youtube channel. I just love the way the booklet looks inside the treasure chest! Hi everyone, I just found this great site called 3eyedbear which has some adorable free cut and paste patterns for you. Perfect for the avid gluer in your family....which in this case, happens to be me! First you print out your chosen image and then follow the provided guidelines for what to cut and what to fold. After that, it's a simple matter of using your Helmar Tacky Craft Glue to assemble it. If you need any help with origami folding here is a great site for explaining those mountain and valley folds, yeah...I needed some help in that regard! Now it looks pretty darn cute as it is, right? But, as you can see from the first picture I just had to get out my Helmar Gemstone Glue and add some pearl eyes, and added a paper beak for some dimension and some feathers for wings for texture...and a couple of other pretties as well. I do like me some sparkly stuff. First I added a little branch and some leaves to the front of the chest using my Helmar 450 Quick Dry Adhesive. I also used my Helmar 450 Quick Dry Adhesive to make him a sturdier body by adding a cardboard paper roll for him to be attached to, that way he isn't so fragile. I added a thick coating of 450 to the top of the chest and then sat the cardboard roll on top and added the owl over it. Now I have the honor of doing 2 posts in one week, so check on Friday the 15th for my second post to see what little surprise I tucked inside the box. New Year's Resolution "Create your own Cards"
here sharing with you my venture into saving money this year by creating my own all occasion cards featuring Helmar Permanent Adhesive Runner . All the cards are a standard 4" x 6" and fit easily into a legal size envelope. Begin by cutting a piece that is 8" x 6" as you base card. Fold it in half to measure 4" x 8" making a firm crease. Now I don't know about you but I have loads of bits and pieces from paper collections I have used through out the years which are perfect to create the cover of your card. across the pieces and adhere to the card. I use it on even the smallest pieces including the flowers and ribbon. The bond is super strong! This card looks like a large tag on the front but opens into a regular card. Helmar Permanent Adhesive Runner . Happy New Year! Jenn here, with a resolution-inspired tag (or bookmark) for the bibliophiles out there! Last year I set a challenge for myself (through Goodreads) to read 75 books in 2015. Well, I flew past that goal in October, and I've been debating on whether I'd do the challenge again, this year (I'm still undecided), but it did inspire this tag/bookmark that is all about the best part of what reading can do. 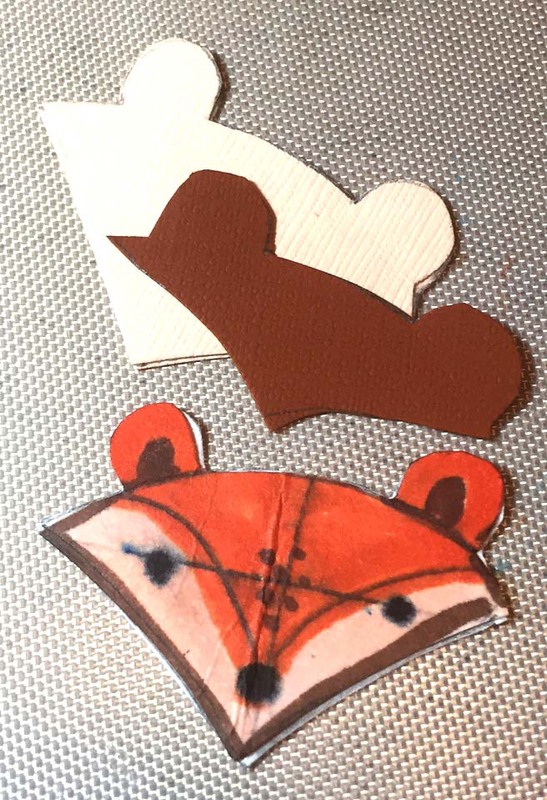 Cut out tag shapes from both the book page and map. Even though you won't use the entire tag-worth of map, cutting it out in the shape helps keep the proportions right in the next step. Position the partially-opened zipper along one edge of the map and secure completely with a layer of Helmar Super-Tac Glue. When attaching a heavy fabric to paper, it helps to use a spreader, spatula, brayer or some other tool to really work the adhesive into the fabric and press them together. Give it time to dry fully (or grab your heat tool) before moving on to the next steps. 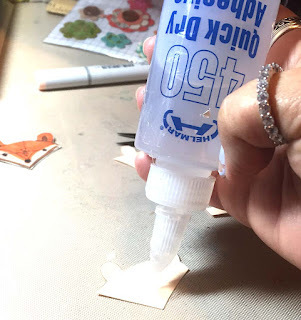 Glue the trimmed book page to the tag with Helmar Decoupage & Craft Paste. Spread a layer of Helmar Decoupage & Craft Paste on top of the book page and use that to glue the trimmed zipper-and-map section into place. Make sure your edges are good and glued down before adding your embellishments. Stamp or write your sentiment onto the tag and attach cutout ephemera with more Helmar Decoupage & Craft Paste. Pen detailing can add great dimension to your flat embellishments and edging your tag with a stamp pad can make it feel more finished. Finish the bookmark by adding a nice, full tassel. I used a combination of leather cording, ribbon, twine, and eyelash yarn. Whether you're challenging yourself to read more or want to make something fun for your book club members, a bookmark (even in this digital age) is a nice little extra.